Wow delicious halwa...glossy halwa looks prefect n cute..
Shankari: Yes. it is so smooth and shiny. Mrs Kannan: The color I think is because of the saffron that I used in the recipe. this is sooo new to me,but must be delicious! That looks lovely, P! Belated New Year and Pongal wishes to you! Got back from India a few days ago. Not completely back in the groove yet. I have tried your banana muffin its the favorite of my 2 year old. I too have a food blog but have never put much effort into it. Going to post some recipes with pictures starting this year. I wish this year to fulfill all your dreams come true. The dish is so colourful and tempting and made me to try it out. Thank you for the dish. 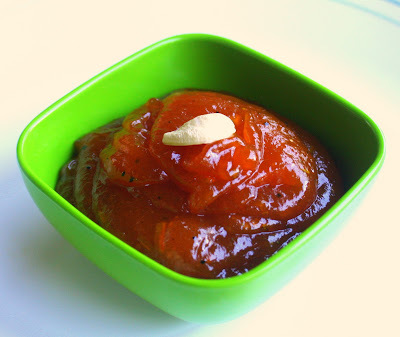 This is my first visit to your blog...was really impressed by the halwa pictures and had to try it...tried it today and it came out excellent...thanks for sharing the recipe. 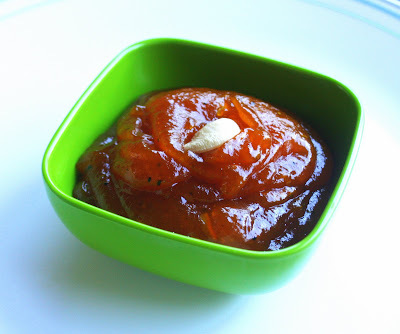 Hi, this looks yummy and I wanted to try to make it.....but how much halwa do I use? There is no amount listed. I have mentioned in the recipe. Please use one can of mango pulp. Let me know if your feedback. thanks for trying this recipe.